I am Sandeepa aka Bong Mom, a regular mom aspiring to be the quintessential Mother every Bong has. Growing up all over West Bengal, and some parts of Bihar, in a Bengali household I learnt one thing, Bengalis love to eat, feed others and cook (at least Bong women do). That they love to eat and are connoisseurs in this matter is proved by the fact that Kolkata is teeming with all The Madras Tiffins, the Punjabi Dhabas, the Tibetan Delights, the Chinese Chow Chow and the Timbuktu Taverns. No where else in India will you see such a fare. All other regions mostly are focused and stick to their cuisine but Kolkata has it all. So growing up amongst such a race it’s natural that I love to eat and to make my food dreams into reality have taken to loving cooking my food. I get solace in cooking, the comfort of the spices sputtering in the oil, the waft of the jeera & tejpata as they turn brown, the rich yellow of my musuri’r dal gives me peace, makes me calm and in this far off land makes me connect to my home. I start this blog as an acknowledgement to my Ma, Dida, mom-in-law and all the mashis-pishis, kakimas-jethimas who fed me well, fed me good all my years in India. This will be a humble collection of Bengali recipes and the food I cook representing Bengali Cuisine as I know it. I want to pass on my legacy of Bengali food to my two little daughters and all the other little ones out there who growing up in a foreign land will find a way to connect to their Bangla roots through the smell and taste of Bangla cuisine. 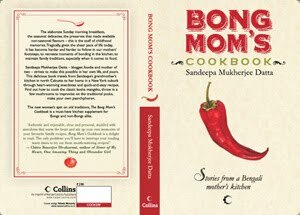 This is also for all non-Bongs, to try out and sample the nuances of Bengali Cooking. Ummm well...so that my maachher kalia tastes exactly the same every time. So, that in some remote future I can proudly say, I have made Gokul Pithey, with full proof of picture et al. So that there is a place for the recipes I gather from all of Bengali motherhood. So that my daughters' don't grow up believing "paneer butter masala" is India's national food and they appreciate the layers of taste and flavor that Bengali and food from all over India brings. How old are your daughters ? BS, the Big Sis is 9 and LS, the little sis is 4 and three quarters. This is as of May, 2013. But age is dynamic. In the book which I started writing way back in 2011, they are 7 and 3 . Do you live off the blog ? Wouldn't that be wonderful ? But nope. I am an engineer by education. I have undergrad degrees in Physics and Electronics Engineering and then a MS in EE. Sadly I work to fund for that all-clad saucier you see on my blog and the bunch of dhonepata that I put in my food. But what is this Bengali Cuisine you keep talking about ? I have time to kill. Anything more ? Do you do food writing ? Best way to get in touch with you ? Now though I would love to, I am usually not very prompt checking my blog e-mails since I have a real life that demands a lot of attention. So if I am not responding to your comments or replying e-mails please try to understand. I will. Rather late than never. Don't send me a friend request. This is a Page and you can just jump in by hitting "Like"
Wait, who does the photography, design etc. of your blog ? I have outsourced it to Mars. Just kidding.This blog is solely operated by me. Writing, Photography, Blog Design, Cooking, Recipe Writing -- all by yours truly. What can I say ? I am bit of a control freak and also I enjoy doing all of it. By far and now, you seem to be very relaxed, by the rich presentations, notes and collections. Iam into this blog world just months ago and wish pleased to see your site! Will keep visint often, as you are in my blog roll to frequent, happy cooking!! What a lovely write-up Sandeepa. Enjoyed reading it. Great blog. Keep it up. Just hope that it will also take a cookbook avataar some day. First of all, your blog is great! Thank you for offering so many delicious recipes! I've noticed your entries can not be hilighted and "copied". Can you please tell me how you did this, so that I can do it for my own blog as well? This is really a great feature for copyright protection. Hi Sandeepa, I'm really entralled with your blog and not just with the recipes (which are fabulous) but also the stuff you write generally (e.g., the first job in Mumbai away from the hometown - I've been through that too!). I'm a Marwari married to a Bengali and we are living in London at present - so it's like you say in your blog - the fragrances and flavours of Indian cooking are just one way of connecting with home. I've only just discovered the wonderful world of Indian food blogs because I'm on a short break from a rather hectic career so scrolling through blogs like yours is quite therapeutic. My Bong husband sure is pleased with the couple of dishes I've tried so far from your blog! Keep the creative juices flowing! 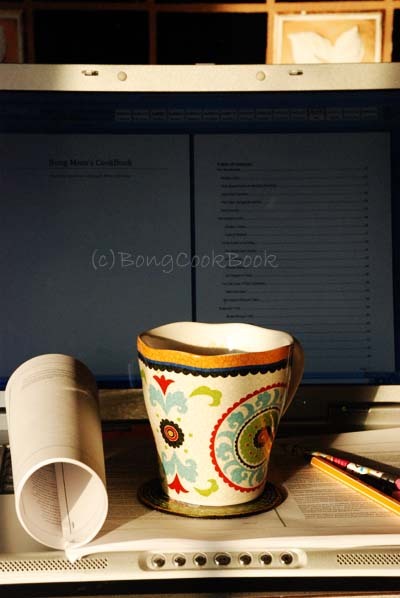 Hey this is a nice intro...I am searching net for authentic bong recipes..and surprise surprise..I land here...what better way to cook bong than from the host's own space!...I have noted down few ..let me see how it will come up!.. Your recipe for "Mango Dal" was brief and to the point. Thank you. I am new to blogging and want my comments posted in the page for "Tak Dal"
1. Musoor dal is easily available. In many parts of India Matar dal name is unknown. 2. The mango pieces can be precooked in water and the water drained off to remove the "kas" or bitterness. Just visited your Blog as I was looking up for Bangla recipes. Glad I found your blog. I'm an American married to a Bangali and we both love to eat! Some of his family is coming over this weekend for a barbeque. I'm grilling trout and shrimp kabobs and HAVE to make masoor dal (hubby's fav) and bhat. I'm also going to try your Ada Fulkopi recipe. He said my first attempt at fulkopi dalna was just okay because I didn't use enough oil. Oops, guess I'm too health conscious sometimes. Anyway, look forward to trying your recipes! Can you recommend any that are quick and easy? Hi Sandeepa, what a great blog. I am inspired by you. Keep going . I too grew up in Kolkata. So am very sentimental about Bengali food and street food. I want to print out your recipe for Maacher Kalia and Khejur gurer payesh for my personal cooking sessions. Just wanted your permission for that. Also khejur gur is not available in Mumbai where I live now. How do I prepare it at home ? Hey Sandeepa. I'm a new blogger and am trying to get into the DesiMomz club, and sent you an email regarding it. Not sure if you received it or not. How do I join? Can you send me your email id? Thanks! happy durga pooja to you and your family, dear Sandeepa. Hi, I have just started blogging. I was thinking about writing about bengali food, when I stumbled uopn your blog. Simply amazing!!! to see such colorful recipies. Hope you will give your footsteps on my blog called Logi-call at http://logi-call.blogspot.com/ soon to give me some inspiration. This does not have any relevance to your post but I could not get another email address for you. Every few months I have had posts of mine copied wholesale by one paper or another. The latest, and for the third time in a row, is The Times of India group. They published a piece today which was a straight lift from something I had written in May 2006.The proof is there on the blog in the form of photographs. Please follow the links as well so you will know some of the history of their ongoing plagiarism. My blog is not high prose...nor is it fantastically creative. Nevertheless we all own our words and photographs, published, as they are, not for money but, for the sheer joy of writing about what interests us. I would be very grateful if you could log onto the site and support me by leaving a comment. It will be immensely helpful for a prospective battle against this very arrogant Goliath. I absolutely looooove your site and your take on masoor dal with bok choy was a winner when I tried it....very cool idea. I have posted a few recipes, which I'll share with you soon. I am from NJ too and have a 5-yr old daughter...:) Keep up the great work! There are many recipe sites but an authentic one like yours is a rarity! Hello Sandeepa, I am a Gujarati-American mom of a 1-year old, married to a Bengali. I love food, but am new to Bengali food (as of 5 years now). I want to be able to make foods that my hubby loves from his childhood and also for my son to enjoy both his Gujarati and Bengali heritage. Your blog is amazing! I have now made a couple of your recipes and my hubby thinks they're as good as his mom's! Now that's a compliment!! Your blog is inspiring and I hope you continue for a long time to come! Thanks! Even then if you want it, where do I reach you ? Such a lovely way to put words to your feelings. I am a closet cook and not that bad i guess. your blog is an inspiration. Maybe i will take some time out from working, cooking and feeding and make one of mine. awesome blog. I had not touched either the "khunti" or the "istiri" during grad school days. reading your blogs, i am now a fully fledged cook who can feed 20 people with half a day's notice :) thank you very much. I tried ur bhapa doi recipe. Happy blogging . God bless u. Came across your blog when I was struggling with bong cooking. I am a bong who's moved to the US and hates cooking and loves bong food. So I had to step into the kitchen. You blog has been a life saver. God bless you. and after reading your 'why I blog' I am trying to find the same solace that you wrote about. Keep the good cooking up! I think i will be a regular here for the recipes..
Sandeepa, I love the concept of writing smthg down which you can pass on to your daughters. I started my blog a few weeks ago bec I had learnt how to cook from the women in my family, but unfortunately, they never wrote anything down. I think it's a lovely idea to document everything for your children. This winter when I am in Karachi, I hope to get my mother-in-law's recipes which she has scrawled in a notebook. My father was posted to Dhaka in the late 90's, so I am familiar with Bengali cuisine, I especially like the way you prepare your prawn dishes. Lovely, lovely site. Best wishes. Great blog. Definitely keep it up. What kind of a wet grinder do you use and where did you get it? Would appreciate if you shared the information. Hi, bong mom...your blog is very interesting...and informative too..have just begun blogging and coincidentally its a food blog. Also am part Bong since have been married to one for 13 years now! I feel the way you express about food too...I love a simple musuri dal with sizzling paanch phoren on the top; beats a gourmet meal any day!! Hello Bong Mom! I absolutely love your blog! I have just recently put together my own blog and would like to ask you for your advice on how to copyright the text and pictures on my blog. Any guidance you can provide would be much appreciated! Hi Bong-mom!I'm a Bong married to a Punjabi.I had a chance encounter wid ur blog & I'm just lovin' it!I've read some of ur fantastic recipes & m so glad I came across ur blog!Keep up da good work!I'll try ada phoolkophi dalna soon. http://mahen3d.com provide innovative solutions for all your business needs, ecommerce web site design, flash website design, website templates, accessible web site design sydney. Mahen3D.com, has been selected to receive The American Association Of Webmasters, "Gold" Award. Have they not plagiarized your content word for word? Thief and a lazy thief too. Huh! I am a mom of half-bongs and the wife of a full bong! I am a bit isolated and always in need of good recipes. I am trying your bhaja dal with shrimp and cauliflower today. I have had this made by my shashoori and your recipe looks really great. I'll let you know how it turns out! Kolkata is also famous for its Kachchi Biryani (Not the Hyderabadi version); is it possible to get the authentic recipe? Hi, Kamon acho? Thank you so very much for this amazing Blog!!!! I love eating and cooking a lot and i think I should learn some Bangla-Cooking! It looks so tasty - and so healthy! Dekha hobe! I stumbled upon your blog today for the first time and loved reading it ... you have a flair for writing and I loved gling through your recipes. One of my fav past-times is reading recipe books and I spent a good hour or two on your blog ... time well spent. Quite inspiring too. Hi Sandeepa, Just wanted you to know that as a bong living away from bong land who never learned to cook bong food, I would never have learned to cook bong food with you - you have have been instrumental in teaching me! So thanks for the blog, the recipes and the writing! I have been peeping into your blog for about a year now, in fact you taught me to cook! Thanks for that. I have been writing a bit too, and just today I referred to your blog in one of my posts. So wanted to know if that's okay with you, if I refer, and add you to my blog roll? I love your blog! Excellent source of inspiration. A question chana dahl and yellow split peas looked very similar. Are they? Can we exchange them in receipes? I love the way you write. Makes me want to try out your recipes. What a lovely blog! I love Indian food and look forward to trying some of your recipes. I am a newbie, I did create a blog of myself but clueless why it never comes through google search whenever I search it, do you mind teaching me basics of food blogging. Tried looking for your email, but in vain. Just wanted to pass on this versatile blogger award to you at my space. Please accept it. how does one e-mail you? Please check you email. There is an important message for you. You're blog is seriously awesome! I'm a 2nd generation Indian-American - Bengali, I've lived in Calcutta for some years and your vivid description and anecdotes with each recipe really bring back some cherished memories. What you have here deserves serious recognition - its inspiring and so informative. Bengali cuisine has so many exquisite dishes that are easily forgotten outside of Bengal as there are hardly any places that offer such meals - especially here in the US, so thank you for taking us back to familiar scents and tastes and sharing our heritage so we won't have to wait for mashis and pishis and kakimas and jethimas to give us a taste of home :)Keep up the great work! Thank you for your blog. A Bengali from Kolkata, after many years of enjoying my mom's cooking, I left Kolkata and moved to the UK. Having never learnt to cook, I often turn to your website for recipes (Ma, while being a brilliant cook is very bad with instructions!!). Thank you for the amazing recipes and simple directions which make even a novice like me able to cook some of my favourite dishes!! thanks so much for your blog. i spent a lot of time in west bengal over 20 years ago and learned to cook with a great cook in a small village but over the years forgot how to do many things (and my friend the cook has passed away). i so much appreciate being able to find the recipes again with clear instructions. Hello Bong Mom, I found your blog via Indian Food Rocks. You and Manisha have changed my life! I'm just a Midwestern girl, now living in Spain and married to Spanish guy who used to be a picky eater. He'll never love veggies and fruits the way we do, but over the last few years Indian has become our go-to food, since they opened an Asian supermarket here. I love that your recipes are simple and well explained--and delicious!! I happened to come across your blog while browsing for guest columnists for our new blog initiative. I'm the Chief Editor for ink.bluegape.com which is an initiative by www.bluegape.com to promote a community of writers, online. We accept submissions from budding writers on a variety of subjects and while we are still shaping a theme for the blog, I'm focussed on food, sports, fashion, lifestyle, music; basically lifestyle. I feel like our readers would be enthralled by the recipes and also relate to them. We would be delighted to have a submission from you, preferably an original one, if you would like to associate with us. We share our posts through our pages on Facebook, Twitter, StumbleUpon & Reddit, and give considerable exposure to writers. Do write back if you're interested. Hi there, love your blog! Any interest in collaborating with us? We're a lifestyle site www.conciergein.com, and we have lots of food-related stuff that your readers would love--currently we have a special on the supergrain quinoa, which is very hard to find in India for the most part. Email us at customerservice@conciergein.com if you'd like to collaborate on a feature together. hey, your blog is really funny. Wonderful recipes - I know a little of bengali food as my aunt is bengali but this is just great! I write about pakistani food and it's great to see such amazing differences in our cuisine! Just found your blog and wanted to say thank-you!! For many years I've been in the wilderness, far away from Ma and Baba and slowly losing confidence in my bengali cooking. I now have hope that I can rebuild and regain the little skill I had, and introduce my dual heritage boys to my half of the cuisine they should inherit. Great blog. Keep it coming! Hi.. I am basically a non-bengali person and I have recently got engaged to a bengali man. He loooovvveeesss food and also is a very good cook himself. Initially when my fiancee started teaching me bengali recipes, I was confused and frightened to no end. I felt that same as a learner of bengali language, I am going to end up becoming a disastrous cook. LOL. But your recipes and blogs are wonderful!! Savior!!! Probably they are the ones who have given me confidence and made a better bengali cook out of me. Trust me you have kind of become my foster mother for cooking. I thank you from the bottom of my heart and please keep introducing new recipes. Loved your blog! Will refer to my friends! Thanks for all the recipes you shared here. Will definitely spread the words among my friends here in Toronto. This is a grouping of the best bloggers across genres. WHO IS A BLOGGER? Anyone who publishes content on user-generated interactive media. This includes Wordpress, Blogger, Tumblr, Facebook, Pinterest, Instagram, Flickr, Twitter, YouTube, Vimeo and other similar platforms. WHO MAY BE A MEMBER? Membership is open to quality bloggers only. An annual review will decide who is in and who is not. And a badge will be provided for the year to select members. There is no cap on the number of members though. WHAT WILL WE ALL DO? Lots of stuff. Engage with brands and companies collectively. Promote one another. Learn from each other. Have meet-ups. Make a joint pitch to advertisers and sponsors. And have a lot of fun together. JOIN US ON FACEBOOK at https://www.facebook.com/groups/blogleague. The idea of the League is to proactively engage with one another. We would like all of you to share suggestions and ideas to make the most of this initiative. Look forward to having you on board. Join us for coffee at the Kunzum Travel Cafe, T-49 Hauz Khas Village, New Delhi 110016. http://kunzum.com/travelcafe. I many times come and visit your site for recipes which I use for myself or sometimes for my guests as well. Love the writing!! Am a logophile myself and appreciate your meticulous care in representation and the sense of humour. Great job. Love the blog. I know you must have heard a thousand times that you write very nice and your blog and book rocks etc. But honestly. your blog and book is really that good that it makes me imagine. and that's what some really good books are right. I wanted to read you right from the first so that I don't miss a single post. and would love to see how a humble blog evolved into exquisite book.